So, with the timeout, ESPN had time to get a proper camera angle ready to go for the potential game-winning kick. ESPN went with a SkyCam angle, which started out fine, directly behind Ruiz. But the camera all of a sudden moved to the right of Ruiz and lost sight of the top of the uprights, leaving viewers with no idea if Ruiz made the kick. There was also a delayed reaction from ESPN play-by-play man Dave Pasch; he may have been depending on the TV angle as well. 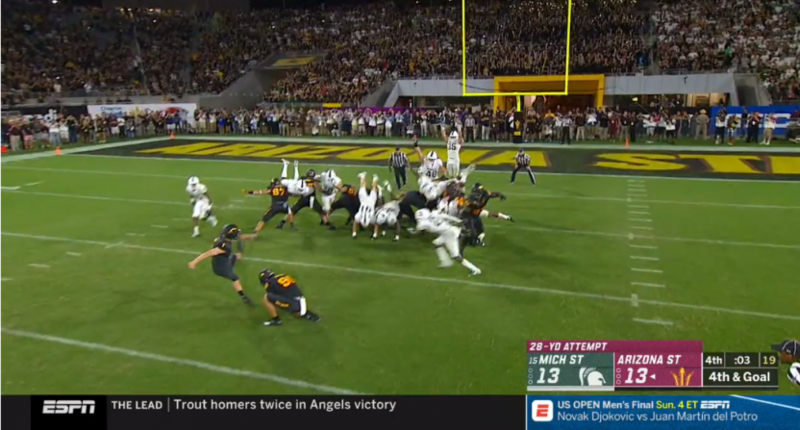 In the first few seconds after the kick, viewers only knew Ruiz made the game-winning kick by the roar of the ASU crowd and the players celebrating.